Easy to use, engineered to a high standard and offered at an attractive price. The M20 & M25 hydraulic pumps are specifically designed for hand pallet truck applications where rapid lifting and lowering on a continuous basis is an absolute requirement. The highly efficient hydraulic pump system makes pumping a breeze, even at maximum capacity. (1) Pull to lower the pallet forks. (2) Push to raise the pallet forks. (3) Centralise for neutral and easy manoeuvring. Due to the very compact design of the pump unit, overall length of the pallet truck is kept to a minimum for maximum manoeuvrability. Furthermore a larger proportion of the load is carried by the large steer wheels giving more positive steering. Listed below are the most common pallet truck frame sizes, steer wheel and load wheel configurations available. However many other frame sizes and types/combinations of wheel are available from stock. 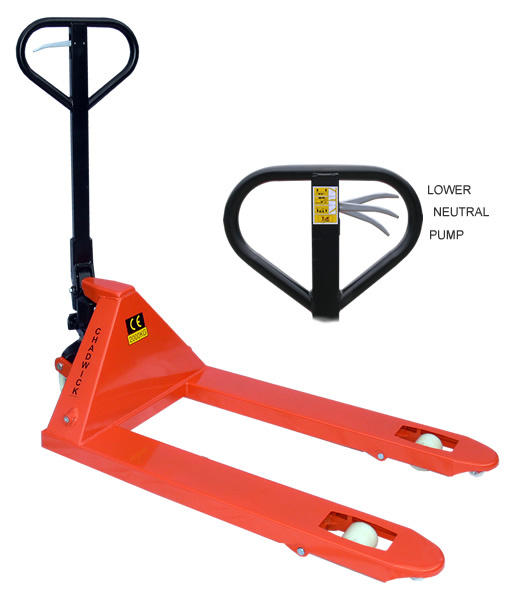 Should you have a special hand pump truck requirement we have the experience and stock to help. Choose nylon pallet truck steer wheels for low rolling resistance and long life at a low cost. Choose polyurethane treaded pallet truck steer wheels for quiet running and better grip. Choose steel steer wheels for harsh working environments such as metal working areas (M25 only). Choose solid rubber treaded steer wheels for quiet running over uneven surfaces. Standard fitment on our hand pump trucks is the single load wheel. For smooth operation on uneven surfaces and crossing sills choose tandem load wheels.